So many hungry people caught a whiff of St. Louis-style ribs and pulled pork barbecue along the Phoenicia stretch of Route 28 this weekend that Smokin Boars BBQ sold out of food on its opening night Friday. Owner Gloria Buley and her son Travis opened the restaurant version of their popular food truck this weekend. Over the last few months, they completed a DIY renovation of their new space, the end unit of the small commercial strip between Mount Tremper and Phoenicia that formerly housed a deli. The result is a homey cafe dotted with repurposed antiques and family memorabilia, including farming and baking tools juxtaposed among old photos of Buley’s mother, whose cooking helped inspire the business. The tables are fashioned from wooden doors that came from an upstate brothel, while the specials board is an old circular saw blade. The lunch menu features lighter options like sandwiches and burgers, while the dinner menu focuses on platters of Southern-style smoked meats, which generally come with a choice of two sides and cornbread and range between $14 and $18. A sampler that feeds two includes a taste of pork, brisket and ribs with sides for $30. Housemade desserts change daily, and include down-home dishes like banana cream pie and rice pudding. Takeout is also available. A beer and wine license is in the works. 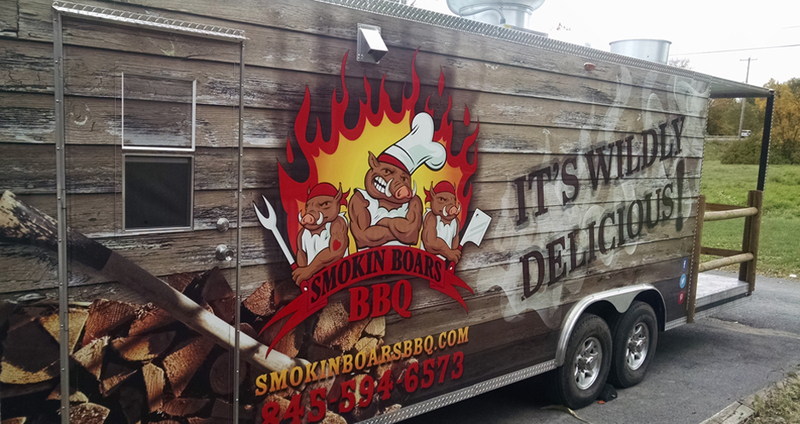 Find Smokin Boars BBQ at 5575 Route 28 in Phoenicia. Permanent hours are not set, but for now it serves dinner Thursday through Monday and lunch on weekends, (closed on Tuesday and Wednesday). No website or Facebook page yet. The phone number is 845-688-3385.